CAF Champions League - Semi Final - First Leg - Al Ahly vs ES de Setif - Al-Salam Stadium, Cairo, Egypt - October 2, 2018 Al Ahly coach Patrice Carteron. REUTERS. 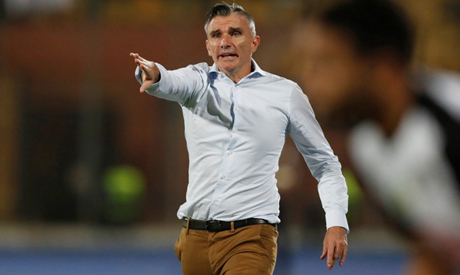 Ahly’s French coach Patrice Carteron has criticised his team for wasting a handful of easy chances after his side’s 1-2 loss against ES Setif in the CAF Champions League semis second leg Tuesday. Despite the loss, Ahly qualified for the final after winning 3-2 on aggregate, thanks to the 2-0 first-leg win the team sealed in Cairo 2 October. Carteron said that the players repeated the same mistake of the Cairo game by wasting a number of easy chances, which gave the opportunity to ES Setif to turn the game upside down. “We committed the same mistake of the first leg as we missed a lot of chances. I was forced to continually stand in the technical area during the game and nervously instruct the players as the game approached its end,” the 48-year-old coach told Ahly TV. “The wasted chances could have affected the final result and I will speak to the players about the importance of using the easy scoring opportunities we get,” Carteron said. Ahly, the eight-time Africa champions, made their way to the second in a row CAF Champions League final to face off with two-time champions Esperance of Tunisia.